After a warm welcome in New York, Kites got an equally rousing welcome in London where the movie had its European premiere on Tuesday. The cast and crew of the movie including Hrithik Roshan, Barbara Mori, Rakesh Roshan, Anurag Basu and Brett Ratner landed at London's Odeon West End cinema for the European premiere of the movie. The movie will release worldwide on May 21. Click NEXT to see more red carpet pictures. Barbara Mori looked stunning in all black as she worked the red carpet. After posing with his co-star, Hrithik did the honours with wife Suzanne. Eager fans mobbed Hrithik for autographs and pictures. 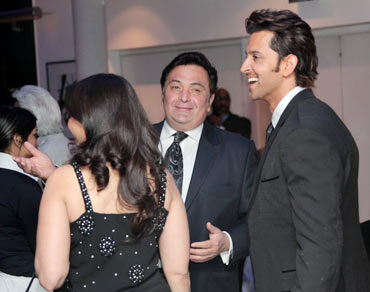 Spotted among the lucky few is Rishi Kapoor. 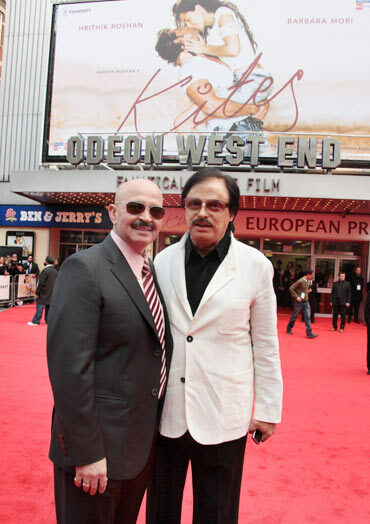 Rakesh Roshan poses with Suzanne's father Sanjay Khan. Rajesh Roshan, Anurag Basu, Rakesh Roshan, Brett Ratner, Barbara Mori and Hrithik Roshan pose at the after show party.